While Valve busies itself thinking with portals, Portal designer Kim Swift let her mind wander to newer, fluffier dimensions. Quantum Conundrum is the result of those wanderings, and it looks amazing. Quantum Conundrum shares many similarities with the series Swift left in Valve's capable hands. 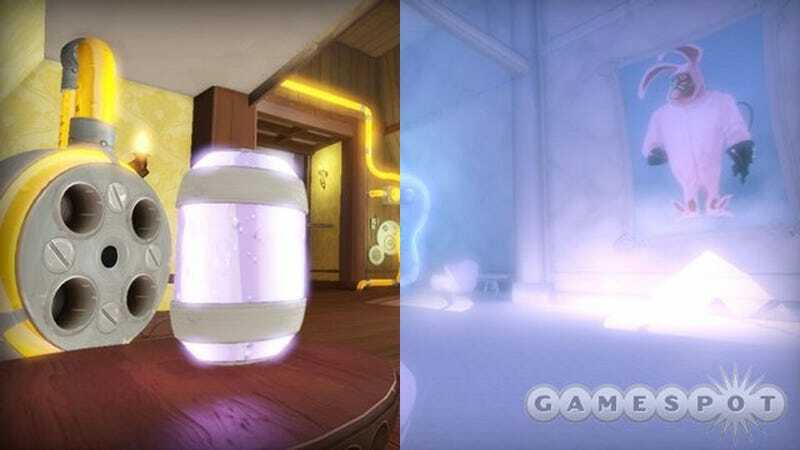 Both are first-person puzzle games. Both involve mad science. Both are built around a handheld scientific miracle. But where the Portal gun helps players travel through space, the IDS (interdimensional shift device) glove lets them travel between dimensions — including the fluffy dimension, which I shall one day call my home. In the game you play a young boy that finds himself trapped in the ginormous mansion of his mad scientist uncle. The uncle has gone crazy-buckets, and it's up to you to utilize your newly-found dimension-hopping skills to navigate the mansion and possibly save the day. The Gamespot video explains how this works far better than I could. Basically you're shifting between dimensions in order to take advantage of each one's special physical and spatial properties. For instance, everything is much lighter in the fluffy dimension, so moving heavy objects is a breeze. The slow-motion dimension is perfect for those moments when you need a few extra seconds to get yourself between point A and point B. Have a look for yourself! Completely charming, isn't it? The last time I was this enthralled with a concept it had a gun that shot holes. Go figure. Quantum Conundrum is due out early next year for Steam, Xbox Live Arcade, and the PlayStation Network. Until then I'll dream of my fluffy dimension home.